The Nectar of Devotion is Srila Prabhupada's summary study of Bhakti-rasamrita-sindhu ("The Ocean of the Pure Nectar of Devotional Service") by Rupa Goswami, a direct disciple of Chaitanya Mahaprabhu. 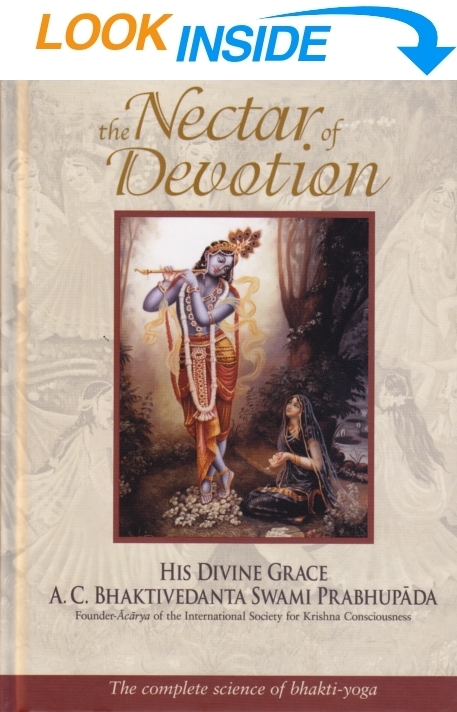 Readers will find in The Nectar of Devotion many interesting and instructive pastimes of Krishna and His devotees, from a variety of Vedic scriptural sources, each meant to illustrate a particular aspect of rasa—relationship with Krishna—and to show how each manifests practically in one's life. Srila Prabhupada specifically composed The Nectar of Devotion as an essential volume for practitioners of bhakti-yoga, Krishna consciousness. Part one consists of four "waves," the first being a general description of devotional service. The second concerns the regulative principles for executing devotional service, and the third wave, devotional service in ecstasy. In the fourth is the ultimate goal, love of God. The Nectar of Devotion explicitly describes all these topics along with their different symptoms. Narrated by Amal Bhakta Dasa. Approximately 21 hours and 20 minutes. Slight imperfections have occurred during the transfer from the original cassettes to the MP3 format CDs. Here is a general description of devotional service given by Sri Rupa Gosvami in his Bhakti-rasamrita-sindhu. Previously, it has been stated that devotional service can be divided into three categories—namely devotional service in practice, devotional service in ecstasy and devotional service in pure love of God. Now Sri Rupa Gosvami proposes to describe devotional service in practice. Practice means employing our senses in some particular type of work. Therefore devotional service in practice means utilizing our different sensory organs in service to Krishna. Some of the senses are meant for acquiring knowledge, and some are meant for executing the conclusions of our thinking, feeling and willing. So practice means employing both the mind and the senses in practical devotional service. This practice is not for developing something artificial. For example, a child learns or practices to walk. This walking is not unnatural. The walking capacity is there originally in the child, and simply by a little practice he walks very nicely. Similarly, devotional service to the Supreme Lord is the natural instinct of every living entity. Even uncivilized men like the aborigines offer their respectful obeisances to something wonderful exhibited by nature's law, and they appreciate that behind some wonderful exhibition or action there is something supreme. So this consciousness, though lying dormant in those who are materially contaminated, is found in every living entity. And, when purified, this is called Krishna consciousness. There are certain prescribed methods for employing our senses and mind in such a way that our dormant consciousness for loving Krishna will be invoked, as much as the child, with a little practice, can begin to walk. One who has no basic walking capacity cannot walk by practice. Similarly, Krishna consciousness cannot be aroused simply by practice. Actually there is no such practice. When we wish to develop our innate capacity for devotional service, there are certain processes which, by our accepting and executing them, will cause that dormant capacity to be invoked. Such practice is called sadhana-bhakti. Pure devotional service is the beginning of all auspiciousness. Pure devotional service is rarely achieved. Those in pure devotional service deride even the conception of liberation. Pure devotional service is the only means to attract Krishna. Krishna is all-attractive, but pure devotional service attracts even Him. This means that pure devotional service is even transcendentally stronger than Krishna Himself, because it is Krishna's internal potency. However, the perfect spiritual concept of life is complete knowledge of one’s constitutional position, in which one knows enough to dovetail himself in the transcendental loving service of the Lord. One must know that he is finite and that the Lord is infinite. Thus it is not possible to actually become one with the Lord even if one aspires for this. It is simply not possible. Therefore, anyone who has any desire or aspiration for satisfying his senses by becoming more and more important, either in the material sense or in the spiritual sense, cannot actually relish the really sweet taste of devotional service. Srila Rupa Gosvami has therefore compared possessing these bhukti (material) and mukti (liberation) desires with being influenced by the black art of a witch: in both cases one is in trouble. Bhukti means material enjoyment, and mukti means to become freed from material anxiety and to become one with the Lord. These desires are compared to being haunted by ghosts and witches, because while these aspirations for material enjoyment or spiritual oneness with the Supreme remain, no one can relish the actual transcendental taste of devotional service. The authorized descriptions of bhakti, or devotional service, following in the footsteps of previous acharyas, can be summarized in the following statement by Srila Rupa Gosvami: “First-class devotional service is known by one’s tendency to be fully engaged in Krishna consciousness, serving the Lord favorably.” The purport is that one may also be in Krishna consciousness unfavorably, but that cannot be counted as pure devotional service. Pure devotional service should be free from the desire for any material benefit or for sense gratification, as these desires are cultivated through fruitive activities and philosophical speculation. Generally, people are engaged in different activities to get some material profit, while most philosophers are engaged in proposing transcendental realization through volumes of word jugglery and speculation. Pure devotional service must always be free from such fruitive activities and philosophical speculations. One has to learn Krishna consciousness, or pure devotional service, from the authorities by spontaneous loving service. This devotional service is a sort of cultivation. It is not simply inaction for people who like to be inactive or devote their time to silent meditation. There are many different methods for people who want this, but cultivation of Krishna consciousness is different. The particular word used by Srila Rupa Gosvami in this connection is anushilana or cultivation by following the predecessor teachers (acharyas). As soon as we say “cultivation,” we must refer to activity. Without activity, consciousness alone cannot help us. All activities may be divided into two classes: one class may be for achieving a certain goal, and the other may be for avoiding some unfavorable circumstance. In Sanskrit, these activities are called pravritti and nivritti—positive and negative action. There are many examples of negative action. For instance, a diseased person has to be cautious and take medicine in order to avoid some unfavorable illness. Those who are cultivating spiritual life and executing devotional service are always engaged in activity. Such activity can be performed with the body or with the mind. Thinking, feeling and willing are all activities of the mind, and when we will to do something, the activity comes to be manifest by the gross bodily senses. Thus, in our mental activities we should always try to think of Krishna and try to plan how to please Him, following in the footsteps of the great acharyas and the personal spiritual master. There are activities of the body, activities of the mind and activities of speech. A Krishna conscious person engages his words in preaching the glories of the Lord. This is called kirtana. And by his mind a Krishna conscious person always thinks of the activities of the Lord—as He is speaking on the Battlefield of Kurukshetra or engaging in His various pastimes in Vrindavana with His devotees. In this way one can always think of the activities and pastimes of the Lord. This is the mental culture of Krishna consciousness. Similarly, we can offer many services with our bodily activities. But all such activities must be in relationship with Krishna. This relationship is established by connecting oneself with the bona fide spiritual master, who is the direct representative of Krishna in disciplic succession. Therefore, the execution of Krishna conscious activities with the body should be directed by the spiritual master and then performed with faith. The connection with the spiritual master is called initiation. From the date of initiation by the spiritual master, the connection between Krishna and a person cultivating Krishna consciousness is established. Without initiation by a bona fide spiritual master, the actual connection with Krishna consciousness is never performed. This cultivation of Krishna consciousness is not material. The Lord has three general energies—namely the external energy, the internal energy and the marginal energy. The living entities are called marginal energy, and the material cosmic manifestation is the action of the external, or material, energy. Then there is the spiritual world, which is a manifestation of the internal energy. The living entities, who are called marginal energy, perform material activities when acting under the inferior, external energy. And when they engage in activities under the internal, spiritual energy, their activities are called Krishna conscious. This means that those who are great souls or great devotees do not act under the spell of material energy, but act instead under the protection of the spiritual energy. Any activities done in devotional service, or in Krishna consciousness, are directly under the control of spiritual energy. In other words, energy is a sort of strength, and this strength can be spiritualized by the mercy of both the bona fide spiritual master and Krishna. Srila Rupa Gosvami has also quoted a definition from the Narada-pancharatra, as follows: “One should be free from all material designations and, by Krishna consciousness, must be cleansed of all material contamination. He should be restored to his pure identity, in which he engages his senses in the service of the proprietor of the senses.” So when our senses are engaged for the actual proprietor of the senses, which is called devotional service. In our conditional state, our senses are engaged in serving these bodily demands. When the same senses are engaged in executing the order of Krishna, our activities are called bhakti. As long as one identifies himself as belonging to a certain family, a certain society or a certain person, he is said to be covered with designations. When one is fully aware that he does not belong to any family, society or country, but is eternally related to Krishna, he then realizes that his energy should be employed not in the interests of so-called family, society or country, but in the interests of Krishna. This is purity of purpose and the platform of pure devotional service in Krishna consciousness.